Tired of waiting in long lines at the DMV? Who isn’t? 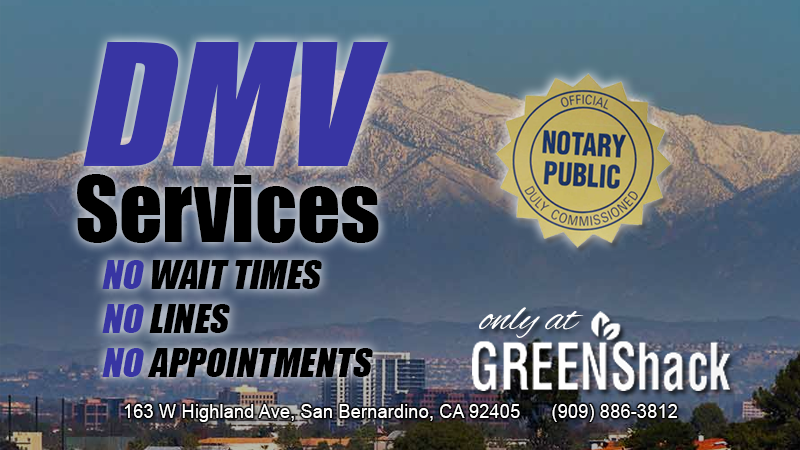 The Green Shack offers DMV services such as vehicle registrations, driver’s license renewal, vehicle transfer – literally everything that a DMV offers except driving school! No numbers, no appointments, no waiting in line – the Green Shack’s DMV services will get you in and out in a fraction of the time it would take you down town. Official of integrity appointed by the state to serve the public as an impartial witness in performing a variety of official fraud-deterrent acts related to the signing of important documents. When you come in to get your DMV services, Notary or Passport, ask for Manal and you will get a FREE DRINK with your service! Congratulations! You found the hidden golden Green Shack logo! Take a picture of this and show it at the register to get a free 6″ shackwich at the Green Shack! First three people get the prize! THREE PEOPLE HAVE ALREADY FOUND THIS. TRY AGAIN NEXT MONTH!